Donegal logistics manager Michael McMenamin spoke to the Inishowen Independent about the sheer devastation in the dressing room after Sunday’s defeat. “It’s completely devastating for everybody involved. I just feel so sorry for the players, especially the experienced ones and I can tell you, that’s one very quiet dressing room in there,” he explained. 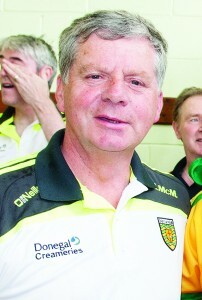 McMenamin believes that although Donegal didn’t perform they may still have won the game with a wee bit more luck. “We definitely didn’t perform but at the same time we didn’t get the breaks and we could possibly have won it with a wee bit of luck,” he said. McMenamin also pointed out that Kerry were the better side over the 70 minutes and deserved their victory. “Ah look, over the 70 minutes Kerry were the better side and they deserved the win. We know that we could’ve played better than we did, we are better than that performance but there is a narrow divide between winning and losing and unfortunately we finished on the wrong side of it today,” said McMenamin. Just like Michael Murphy, McMenamin couldn’t put his finger on why Donegal failed to perform on the day. “Its too early to say why we didn’t perform really. What I do know is that we prepared properly, we had a very good training camp last week. Every man was fit which is unusual for this time of year but it just didn’t happen for us on the day. That’s sport unfortunatley,” he concluded.